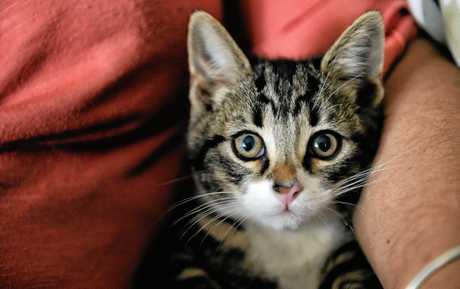 A CURIOSITY for her owner's bedsheets resulted in this very lucky 11-week-old kitten using up the first - and quite possibly a second - of her nine lives. Yamanto resident Katie Gay's kitten Cleo was literally in a spin after being accidentally tossed into mum's front loader. After a rigourous 15-minute cycle, Ms Gay's mother Carole emptied the washing to find faecal matter scattered throughout - without realising Cleo was still hidden in amongst it, clinging to life by the finest of margins. 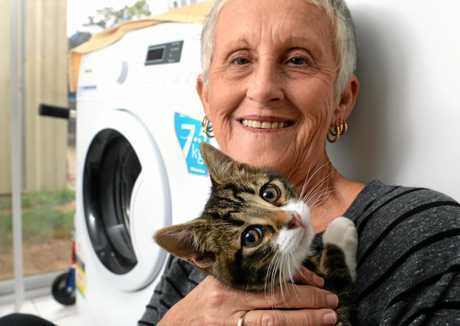 "Mum had taken the washing out and yelled out to me that the cat had done a poo in the washing," Ms Gay said. "She put the basket on the floor to show me and I went in for a closer look, and that's when I found Cleo. "Her eyes were open and her tongue was just hanging out." It was Ms Gay's partner Kerrin Farmer that noticed a slight heartbeat and breathing and the couple raced Cleo to the vet. They arrived about 20 minutes before opening time, but they were in luck, with one of the nurses starting early on Friday morning. To Ms Gay's amazement, Ripley vet Dr Andrew Hemming and his team kicked in to bring her back to health. "She was lifeless and mum and dad thought she was dead," Dr Hemming said. "They brought her in right at the start of the day and we put her straight on a drip and oxygen and did some x-rays. "It took her a couple of hours to come around but she continually improved throughout the day." Expecting a long list of injuries, Ms Gay was even more surprised when the vet let her take Cleo home later that day with no broken bones or ongoing injuries. Since then she has made a full recovery and has even been spotted venturing back into the dirty washing basket that got her into so much strife last Friday morning. "I reckon she's down to seven lives now," Ms Gay said. "She is completely back to normal, as if nothing ever happened. "I actually caught her again on Saturday back in the dirty washing basket."